So, what do you think of Aloe? The color in SW’s infographic above seems very bright, too bright for most interiors. The color on my monitor is pretty unappealing. However, the color on a paint chip from my SW palette is a little more subtle – although I think still pretty loud for most interiors. It’s closer to the image below. And one has to see it in real paint on a wall to really get an idea of its true color. Meanwhile, this gives me a good opportunity to use SW’s updated ColorSnap© app for iPhone/iPad/Androids. The nifty thing is that you can snap an image, or use one from your library, and “draw” a specific paint color color on a wall. Since it’s touch technology, you can use try different colors on different walls and really get a feel for how it might look. 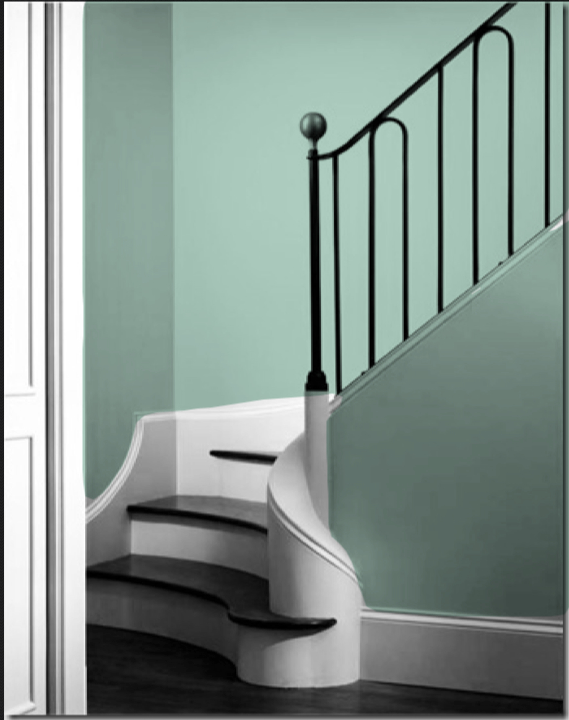 Here is Aloe SW6464 in a stairwell. Still too bright for my taste, but what do you think?